Lytham Round Table is marking its 80th birthday this year with a pledge to raise more money for local charities. The group, which has members from across the Fylde coast, is all about helping the local community while having fun. This year’s chairman, Richard Darby said: “We have a lot of fun and do some extraordinary things. Plans are already in place for Lytham Round Table’s annual fireworks display at the Fylde Rugby Club on November 5, and in the run up to Christmas the group will be helping Santa in his sleigh visit children across Lytham and St Annes. Richard added: “A lot of people join Round Table for its social events. “This year we’ve already built a soap box racer and raced in a charity race, been indoor skydiving and Pro Kart Racing. 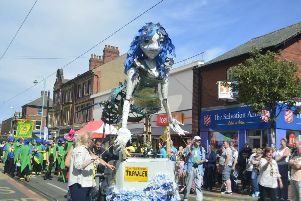 “We also built a float, and dressed up as King Arthur’s Knights for Lytham Club Day Parade. “In the next few months there is Clay Shooting, The Crystal Maze in Manchester and Escape Rooms. “Round Table gives you the chance to have unforgettable experiences and make a real difference in the local community and we’re really proud of what we do and are always looking for new people to join”.